Supplier & Exporter of ASTM A694 Carbon Steel Pipe Flanges, CS A694 Slip on Flanges, Carbon ASTM A694 Lap Joint Flanges, Carbon Steel A694 Blind Flanges Manufacturer in India. 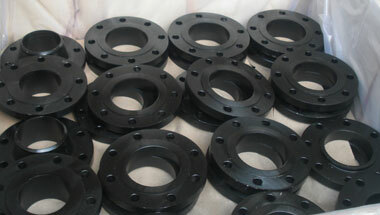 We, Neon Alloys Manufacturing Carbon steel ASTM A694 Flanges using best quality & best available techniques. These are precisely engineered under the firm direction of expert quality controllers to ensure high quality, flawlessness and consistency. Fabricated using premium quality raw materials, our range of carbon steel flanges are meticulously designed with utmost attention to quality. Carbon steels are classified based on the amount of carbon content in the steel. The four main classes are mild and low carbon steel, medium carbon steel, high carbon steel, and ultra-high carbon steel. These Carbon steel ASTM A694 Pipe Flanges are widely used in Application like Petro-chemical industry, Oil and gas industry, Nuclear industry, Pulp & paper industry, Research & development, Mega projects, Defense industry, Development industry others etc. Carbon ASTM A694 Pipe Flanges Manufacturer, CS A694 Plate Flanges, ASTM A694 DIN/ASME Pipe Flanges, Carbon A694 Socket weld Flanges, ASTM A694 Carbon Lap Joint Flanges Suppliers in India. Tunisia, Jordan, Angola, Dubai, Chine, Mozambique, Uganda, Mexico, Ghana, Houston, Saudi Arabia, Morocco, Democratic Republic of the Congo, Sri Lanka, Brazil, Sudan, Malaysia, Trinidad and Tobago, Kuwait, Venezuela, Australia, Cameroon, United States, Africa, South Africa, Algeria, Argentina, Azerbaijan, Turkey, Thailand (Bangkok), Italy, Iran, Russia, London, Bahrain, Egypt, Vietnam, Israel, Ethiopa, Colombia, Indonesia, Peru, Nigeria, UK, Kazakhstan, New Zealand, Iraq, UAE, Germany, Canada. Manama, Jeddah, Kinshasa, Data from the UN, Aqaba, Mecca, Subra al-Haymah, Durban, Byblos, Tripoli, Conakry, Omdurman, Kano, Cairo, Bethlehem, Colombo, Johannesburg, Antananarivo, Singapore, Soweto, Douala, Casablanca, Benin, Kampala, Accra, Abidjan, Harare, Lagos, Zaria, Lubumbashi, Dammam, Mogadishu, Dar es Salaam, Kaduna, Maputo, Rabat, Riyadh, Fez, Doha, Alexandria, Luanda, Muscat, Hong Kong, Giza, Beirut, Abu Dhabi, Port Harcourt, Pretoria, Istanbul, Dakar, Lusaka, Tehran, Algiers, Amman, Dubai, Ouagadougou, Brazzaville, Kolwezi, Ibadan, Bulawayo, Khartoum, Cairo, Sharm el-Sheikh, Tel Aviv, Yaoundé, Jerusalem, New York, Cape Town, Port Elizabeth, Mbuji-Mayi, Nairobi, Addis Ababa, Bamako, Maiduguri, Freetown.